KAE have undertaken design and construction phase roles for a significant number of residential projects. Apartment air flows are often ignored by designers. We see continuously, poor designs due to simple air flow issues. This post discusses; why outside air is required and how getting the right air flows is crucial in an apartment. This is all quite simple and yet often overlooked resulting in; builders warranty claims; poor apartment amenity and higher energy consumption. It’s a code requirement as per the NCC for occupants. Outside air is required for occupant’s health and well-being. This is for breathing and odour control. Where gas heaters are used for heating its required for combustion. Ventilation removes moisture and thus condensation issues. Moisture levels within buildings are often higher than outdoors. The main cause of high indoor moisture levels is the generation of warm moist air by domestic activities. Where moisture lands on cool surfaces (below the dew point temperature of the moist air), water will come out of suspension and form on the cool surface. VOC’s: Non removal of contaminants produced by outgassing of some types of building materials, volatile organic compounds (VOC), can cause discomfort (sick building syndrome). So outside air is required. It cannot be avoided. The problem with outside air in today’s well insulated and well-sealed buildings is that natural air intake is not readily achieved. Designed solutions are required. Also with the drive for energy efficiency the introduction of outside is an energy issue (if you intend to have a controlled environment (heating and cooling). Also if outside air cannot be naturally delivered or induced then mechanically supplied or mechanically induced air will be required which consumes energy (fan power). 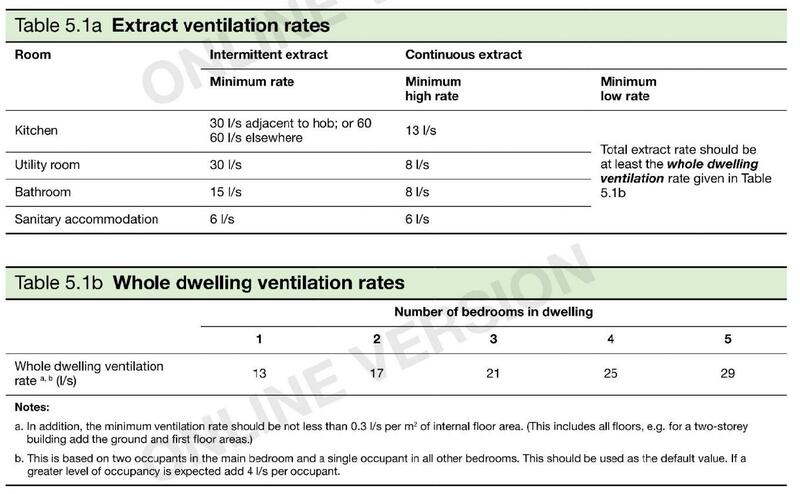 The amount of air for an apartment for condensation control and VOC reduction is not easily found in documentation. This is because it all depends on the amount of moisture vapour produced and the surface temperatures on the various building elements. 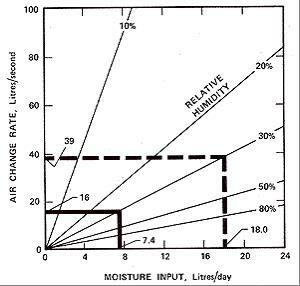 The graph below details some residential moisture rates. From the above it’s not hard to see how 18 litres of water per day can be produced in a domestic situation. The following chart below indicates circa 40 l/s of outdoor air is required for a house. The figure of c. 40 l/s is only a guide as it is subject to many, many variables including outdoor condition of the air (moisture and temperature, moisture production, internal room temperatures and fabric and construction types. 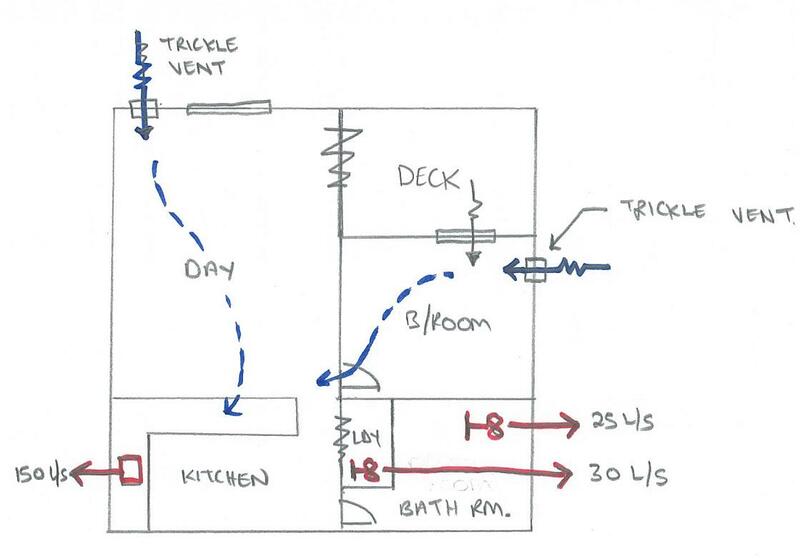 Typically when an apartment is occupied and kitchen exhaust is directed to outside and with intermittent operation of other exhaust systems air flow rates are well in excess of the 40 l/s indicated above. 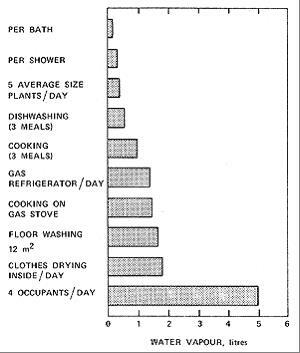 If the air supply is via a filtered outside air system (could be via the air conditioning system), then 7.5 l/s per person of fresh air is required. The current ventilation rate of 7.5 L/second/person is designed to maintain levels of indoor carbon dioxide exhaled by occupants below 1000 ppm. This carbon dioxide level is used as a surrogate for body odours unacceptable to 20% of visitors entering an occupied space. 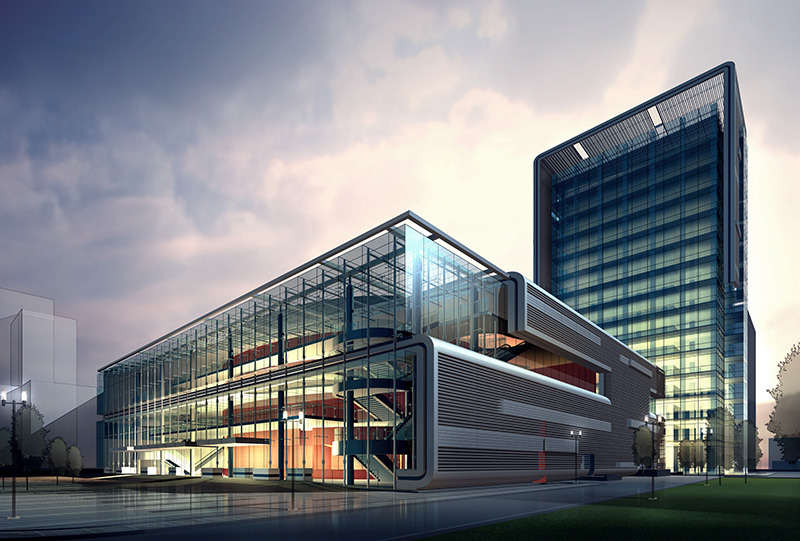 As an alternative (if the air is not mechanically delivered) part F of the NCC allows for air to be supplied by operable openings. The operable opening should be sized at 5% of the rooms floor area. 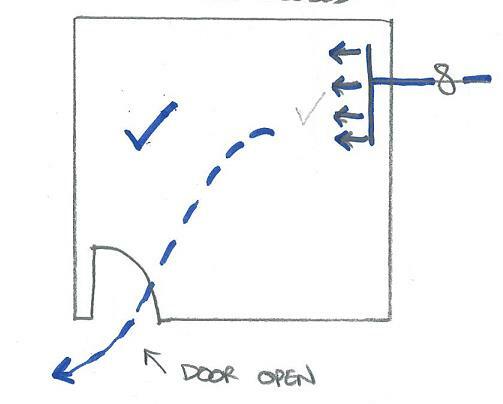 Where openings cannot be used, for example in high noise locations where opening a window will cause in-acceptable internal noise levels, air must be provided by alternative means. The alternative systems include; delivering outside to the apartment’s air conditioning system; by providing acoustic trickle vents where the air is drawn in via an apartments exhaust systems; acoustically designed supply air systems or delivery of outside air by the apartments corridors. Where the development requires stair pressurisation the associated relief air shaft can be utilised to deliver outside air to each floor. Air to each apartment is then via fire dampered air intake (typically a 300 x 200 intumescent fire damper with acoustic flexible is utilised). Where bathrooms and laundry’s are on an outside wall, with an operable window, then natural ventilation can be used. Interestingly domestic kitchen exhausts do not require venting to outside and inactivated recirculating car bon filter can be used. In these circumstances the only outside air to an apartment will be that required for occupants. Where the systems are mechanical and ducted to outside then fresh air equal to the exhausted air volume will be required. If all systems operate together this is 205 l/s of fresh air required, vs say for a 3 bed apartment (3 x 10l/s/person) 30 l/s for occupants. Note: It would be typical to use a diversified air flow. If no means to allow air into the apartment is provided, then the exhaust systems will not work effectively and cause undue fatigue and early failure of the fans. 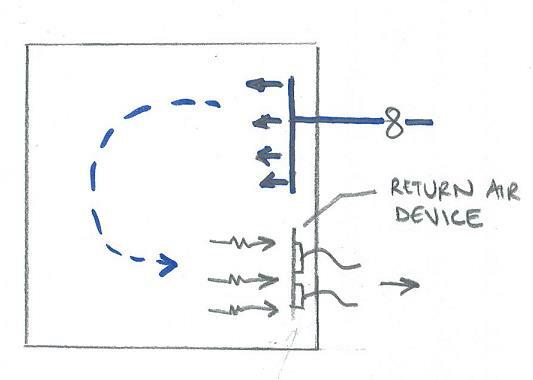 As the fans operate and the apartment becomes more and more negatively pressurised it is not uncommon for make-up air to be drawn from adjacent apartments via wall cavities and poorly installed electrical services and the like. You will soon know what next door is having for dinner. 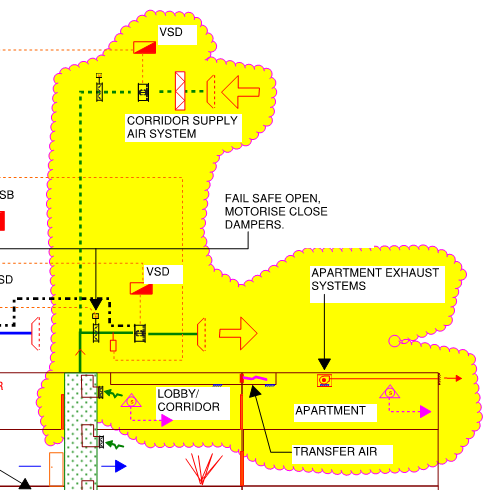 So outside air is required for occupants and for exhaust systems (AS1668.2 2012 requirement) to work. If heating or air conditioning is provided, then this outside air needs to be accounted for in the sizing of this equipment. Introducing outside air for exhaust systems locally. Note: This can provide a good result. 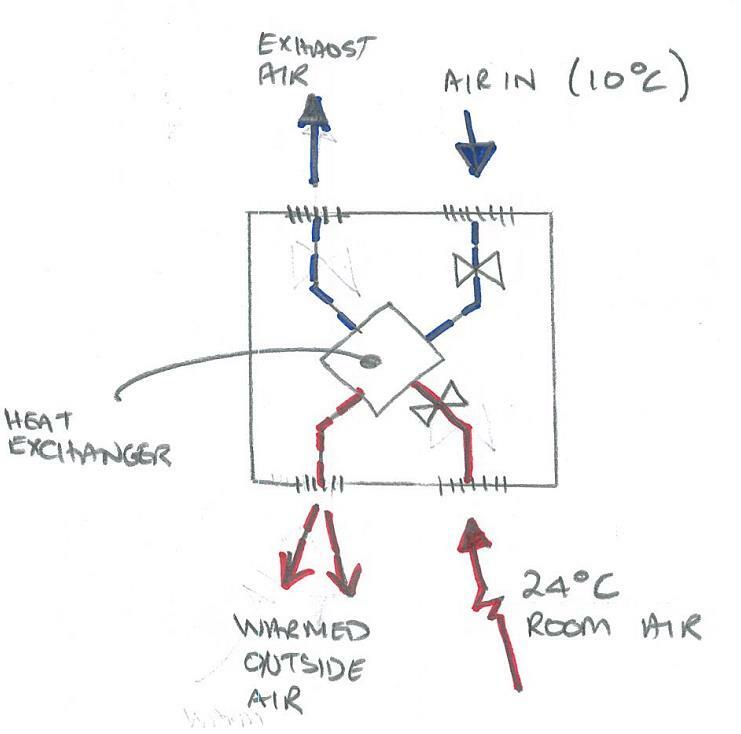 If the make up air is local to the exhaust (allowing for scarification) then the outside air load can, in part, be removed from the air conditioning unit cooling size (This could be around 1kW r). Careful attention to design is required due to the partial pressures of room air and make up air, resulting in vapour moving rapidly into low air pressure regines in an apartment. Note: based on the intermittent usage of ventilation systems and coincidence of the air-conditiong operating at the same time, the pay back on residential heat recovery can be very long. A recent study found pay backs in excess of 69 years. Where gas fired room heaters are installed consideration should be given to a exhaust gas to outside air intake heat exchanger….this is a great opportunity for a gas fire supply! A number of hotel organisations have a ducted outside air system to each hotel suite. The outside air is delivered to the suite only when occupants have rented the suite. The air is off (thus saving energy) when the suite is un-occupied. Typically the room supply air is activated a few hours before guests arrive to flush the room and then turned off a few hours after cleaning. In Australia, it is not typical to pressure test our buildings. This is done in other countries to prove the air tightness of each space. Thus designing for exact air control for occupant health and wellbeing and lower energy costs is avoided in Australia. Air flow into an apartment may be excessive or minimal depending on the construction of the building and jointing details on windows and doors etc. On a leaky building, the air conditioning capacity (where installed) is often struggling to maintain conditions. The above said, it is reiterated that it is a code requirement to provide permanent make up for exhaust systems. In a properly commissioned and witnessed apartment projects, chocking open doors to the corridor or opening windows to get exhaust systems to work, is not tolerated. 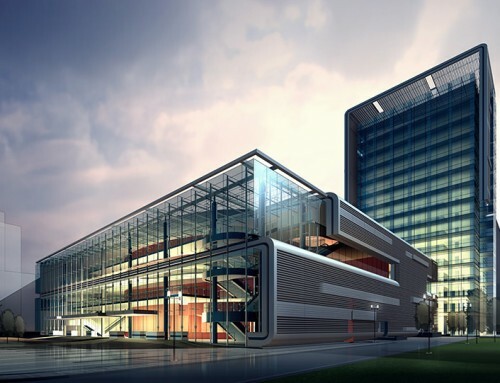 Note: Pressure testing of buildings, in my opinion should be a mandatory item in the NCC…. it will eventually be adopted. Supply air to a room = relief air from a room. 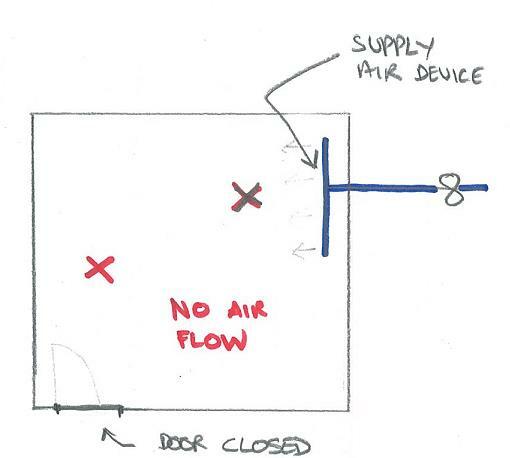 For example if you supply air into a closed (door closed) air tight room the room would become positively pressurised and quickly no more air will be delivered to the room, thus no cooling or heating. A door undercut is often used. 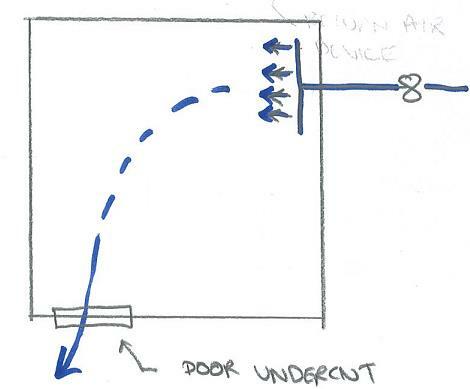 This is OK, but if the bedroom is large and has solar loads, then the door undercut will quickly not be viable. 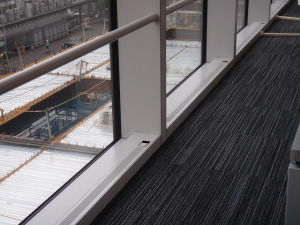 Say 25mm height (above carpet) x 900mm door width and 1m/s = 22 l/s. This would only suit a 4m2 room! 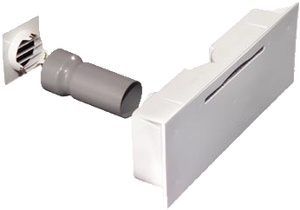 The 1m/s is a rule of thumb and provides a low noise and low resistance solution.